What I am about to write is an analogy. I feel I must give a disclaimer for any of my relatives who may read this, and let them know that this analogy is not a personal one. The character talked about here does not have a present day twin in my family nor bears any resemblance to relations. Maybe you know what I am about to talk about–those family get-togethers that are always awkward. There is always that one relative that makes things odd. I’ll call him the rich, eccentric uncle. You know you need to invite him because he’s family, and you want to invite him because he’s wealthy, and you want to stay on his good side in case you need some big cash someday. Certainly you want to be included in his will. But really?? Why does he always have to be so odd when he comes? He disrupts tradition, protocol, table manners, and re-routes conversations. He tells jokes at inopportune times, tells stories that make people cry, or sits eerily silent. Overall, he keeps everyone nervously guessing what he will do next. He’s not a bad guy, in fact he is really really nice. He’s just not “one of us” really, and we are all indifferent to him. When I think about the Holy Spirit, this is the best analogy I can come up with to explain how the church of today treats Him. He is the Rich, Eccentric Uncle. I mean, He is the Third Person of the Trinity–so He is God, and He is close to the Father and to Jesus, so we really should invite Him to our gatherings. He has some great qualities, we’ve been told, and should we ever get into a pinch, we might need Him, so let’s not tick Him off. But really?? Why is His entrance into a room so…so…messy? He doesn’t seem to care about tradition, or service order. He falls on that one with joy and they burst into laughter. On another He pours out healing, and they begin to weep…sometimes uncontrollably. Demons manifest in His presence, causing people to appear unruly. It’s as if He has no manners. Some people begin to cry out for mercy and forgiveness in His presence, while others begin confessing their sins and changing their behavior. Some people scream as if they are being baptized in fire. It really gets awkward. We’ve read about “Doubting Thomas”, the disciple of Jesus who needed physical, concrete evidence that Jesus had risen from the dead, and asked to touch his wounded hands and side. A bit arrogantly, we might look back and scratch our heads at how Thomas could have been with Jesus for so many years, and still had doubt that Jesus was who He said He was. We are shocked that the Pharisees didn’t recognize Jesus as Messiah and welcome Him with open arms. Why was it so hard to see who Jesus really was? Wasn’t it obvious? I believe that the same doubt and judgement that the disciples and Pharisees had is the same reason you and I mis-judge the Holy Spirit. He is unconventional. He comes with His own agenda. His purpose is to fulfill the will of the Father, to make Jesus known. Like Eliazer, Abraham’s servant, His job is to prepare a bride for a Groom. He doesn’t bow to our traditions, or coddle our pride. He doesn’t answer to our protocol, or take our suggestions. He is God. He is on mission. How can we draw near to a God we are indifferent to? I don’t think anyone really knew what to expect when waiting for the Holy Spirit. I mean, Jesus came with skin on. He was a Jew, and grew up among them. What would the Holy Spirit look like? Would they recognize Him? Would he come knocking or should they leave the front door unlocked? Should someone get extra food to feed Him when He arrived? Where would He live? I’m sure the questions were many. But these disciples were now finally convinced that Jesus was God, and they knew that Jesus had something to give them that they could not afford to miss. They refused to let doubt, or judgment rob them from the Gift, and they made space in their schedules in order to make room for Him. Why isn’t the same value placed on the Holy Spirit in the life of every believer today? Why aren’t we earnestly expectant for the Holy Spirit’s involvement in our lives? What about the lives of our children? Why do we talk about him like a comforter only maybe a step better than a couple of beers, a good movie, a long walk, or an illegal drug? Why do we value Him as someone we might need in a pinch but not really sure why? Why do we blame Him for the weird we see, but refuse to credit Him for the transformation He produces? If we really knew who He was, we would sell everything we had if it could buy everything He is. We would stand in line for hours, days, or weeks to receive what He has for us. We would make sure our children knew Him and received everything from Him that He has to give them. We would make Him the Guest of Honor, and change our lives to revolve around His. If we really understood that He is the Power of God at work in us causing all options in our lives to change by producing miracles, healing, and deliverance; and if we knew that He is the Wisdom of God giving us power, help, clarity, invention, innovation, ideas, art, beauty, and creativity we would stop making our church services about ourselves, and instead turn them into “Upper Rooms” that were all about Him. If we fully trusted His character, we would develop the most intimate of friendships with Him. Like John who laid his head on Jesus’ chest, we would so intermingle our hearts with the Holy Spirit’s heart that we would be afraid to offend Him more than we would fear offending others. We would spend our waking hours in conversations with Him, and our sleeping hours in the rest that His presence brings. We would learn what pleases the Father, and we would see people around us through the Holy Spirit’s lens. We would be moved with compassion to touch the untouchable, reach the unreachable, and love the unloveable. If we really understood what the Holy Spirit possesses, we would stop treating Him like a crutch to be used when needed, but would understand He is the fountain of life that we need to drink from daily. We wouldn’t start a day without Him, and wouldn’t lose Him in the evening. We would make withdrawals on His power and heal the sick, cast out devils, cleanse the lepers, raise the dead, and preach the Gospel. What happened to the Holy Spirit in our churches? We judged Him odd. We don’t like the kinds of crowds He attracts, and we don’t want our kids exposed to weird. We judged Him unfair–when we were younger we saw Him give gifts to people that we wanted, but didn’t receive. We judged Him unfit–He doesn’t quite mesh with our churches DNA, we are going for a more seeker-friendly model where people aren’t uncomfortable in our services. If there is one clarion call I could give to the churches of my generation it would be this: “Sell it all to have the Holy Spirit!” Our children don’t need comfort; they need power. Our cities don’t need “nice” they need transformation. Our families don’t need entertainment, they need a baptism of fire. The Holy Spirit is the promise of all of these things. He is here presently. He is the fullness of God. He is a gift, and you and I need to receive Him. Tucked away in the story of the birth of Jesus are stories of other amazing men and women of faith. One such man was an older man named Simeon who spent his life in eager anticipation of seeing the Hope of Israel. There is something powerful that happens when one generation eagerly invests their life and attention into the promise of the next generation coming after them. When the older, wiser generation refuses to let their life end before they have invested their resources and time in seeing the promises of God fulfilled in those younger than them, it creates a powerful heritage and momentum that is calculated over centuries. Simeon was a man eagerly anticipating and watching for the promises of God to be fulfilled for Israel, and he was watching for the Messiah. He was vigilant in his pursuit of the Hope God had promised. Every child born, and every person who operated in any godly passion and authority was on his radar. He didn’t want to miss what God was doing. It’s easy to look at a politically troubled world and say “It’s all going to hell in a hand-basket!” It’s quite another to eagerly watch for the goodness of God His promises being walked out in the next generation. The joy of being a part of that promise, and not wanting to die until you see the fruit of that promise in those coming after you is something that many people miss. There is a temptation after you have lived a full life to put your motor into park. It’s not really your responsibility anymore what happens with the world, because you already did your part; but what if you could make your life part of the legacy of God’s goodness by continuing to look for the goodness of God in those younger than you, and affirming, nurturing and encouraging them? What if you, who carry the promises of God, passed them on to a generation who needed to hear them? What if you could prophesy hope, victory, and comfort to a world unsure of its future? That’s what Simeon did. Even though baby Jesus was the carrier of the ultimate hope for the world and would likely not understand Simeon’s words, it was to the benefit of Mary and Joseph to hear the promise declared. It was an historical moment for Israel, and you and me that Simeon watched and waited for this Messiah, and then declared the promise of God without shame or reservation when he recognized him in the temple that day. It is to the benefit of your family, community, city, state, nation, that you prophesy (speak the words of God) to the next generation. In even 50 years from now when your children’s children are questioning if God is real, it is your story and mine that they will reflect on for their decisions. So tell your redemption story. Tell it over and over. Tell then next generation that God is faithful and will walk them through everything life throws at them. Tell them that God answers prayer and shuts the mouths of lions, rescues from the pit, redeems from slavery, and recreates from ashes. Tell them there is nothing impossible with God, and they have the power to change the world with God alive in them. Tell them that their hearts will break, and be filled in the process, and the fruit of their lives will continue to encourage and strengthen weak hearts for generations to come. Tell them. * I’m sitting on my deck today, looking out at the view. 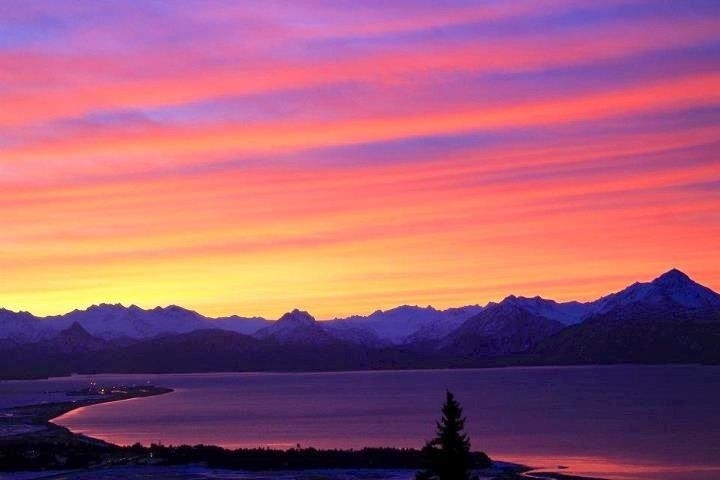 If you have ever been to Homer, Alaska, you will understand it when I say that the view never gets old. But this time, as I am sitting in the stillness, the quiet is interrupted by the sound of a raven in the distance. With a constant cackling, and cawing, the raven is repeating a pattern of swooping down, then ascending again over the head of a bald eagle, perched in its nest. Sometimes the talons of the raven are bared as it descends in attempt to threaten the eagle away from its nest, and other times it uses its most frightening of noises in an attempt to appear more mighty than he is. The eagle flinches, returns a voice that tells the raven to back off, and perseveres through the seemingless endless taunting and threats. I watch in awe wondering how long the eagle will put up with the taunting, and I consider the raven’s perseverence wondering when he will tire and finally give up. If I were to characterize these people mentioned in the above story, Nehemiah would be the “Eagle” and Sanballat and his friends and aids would represent the “Raven”. Nehemiah was a Jew who had been in the captivity of the Persian Empire as a result of when Babylon overthrew Jerusalem, burning its temple and city in 586 BC, and carrying off prisoners of war. That empire was then overtaken by the Persians in 539 BC and the Jewish people that remained in Babylon were now servants of Persia’s kingdoms and policies. Nehemiah was one of these men…serving the Persian King but longing for his homeland. Nehemiah desires to return to Jerusalem and rebuild its walls and fortify the city again, as now many Jews have been given permission to return to their homeland. The King of Persia, Cyrus, agrees to let Nehemiah go and accomplish this dream. The King even helps fund the mission and provide materials for Nehemiah to rebuild the wall. Nehemiah knows he is on a God-sized assignment. That reality alone fuels his passion to finish, but he also knows that his dreams and desires are fires lit by God Himself, and God Himself would have to sustain them. Nehemiah had the strength of the eagle with the King’s resources, help, and permission, but his perseverance in the midst of persecution and threat, he credits to the presence of God in his life, and the purposes of God in his work. Eventually the raven I am watching from my deck becomes tired of his threats not being taken seriously, and retires to a branch on a nearby tree. Squawking and cawing loudly as he perches, he takes a few more minutes to make noise, and eventually flies away unsuccessful. *Photograph courtesy: Laural Sabin photography:Click here to see more of her work. Spring tells the story of hope reborn, and good things yet to come. They’re back. The silence of winter has been broken by the melodies of songbirds. The bleakness of long dark days, that wane into long dark cold nights has been interrupted–even changed. From the boughs of spruce trees and the barren limbs of alders and cottonwood come the melodic tones of the songbirds, who having completed their long migrations from the southern hemisphere, have perched in my trees to welcome my mornings. It’s another sign of the promise of a faithful God who promised that there would be seasons, and that seasons would change. For every Winter there is a Spring, and for every dark night there is a promise of new light, warmth, and fresh beginnings of a day full of new mercy.